You had a lot to say today but it was interesting throughout. It's clear that this one is not for the up-votes, but to share, I like that. More games, more fiat ramps, please! It would be interesting to listen to @hightouch talk about his development of Drugwars and Fundition.io. His reasons for doing so, how much time, if he was living off cheap food as a dev being paid no salary, etc. Because you are right, the work was done without Worker Proposal, or Steem DAO (Decentralized Autonomous Organization) as I think it is currently called. The point still stands though, and apart from the points made by therealwolf, are we desperately needing Steem DAO? I suspect that if the the original dev team could go back in time 3 years, they would code in another pool to collect funding for marketing, dev, 'keeping the lights on'. No-one would bat an eye-lid if this pool was there from the start, and author rewards, for example, were 20% less than they are today. blockbrothers transparency, and lack of from most witnesses. I totally agree that it would be nice to have witnesses explain who they vote for and why. Honestly, I don't think they could come up with a valid reason for some of the votes - It's my alt witness account not being a valid reason! I have a list (that needs updating) on my profile stating reasons for the witnesses I vote, as I am proxy for 10 or so accounts. More of this would be nice, but yeah, I'm not holding my breath. Alright man, you deserve a rest after that message - time to go raid some people's drugs? MY SPS stance is pretty simple. For as long as nobody can show a proposal that requires a SPS and makes me go...aaaa of course! That's why we need it. I don't see the point. Again, I don't mind that it's being build, it's just another project on the chain and therefor it's non of my business. But it will become everyone's business when it requires a Hard Fork and then there better be some good reasons. I'm glad we as @blockbrothers are now 100% transparent about our witness votes. I wish more would follow. The latest list is here. Have you seen the size of the top dogs now? - major unit buying going on! That was nice of you to inform hightouch of the bug! I'm pretty sure some would have left it until it was spotted and reported. 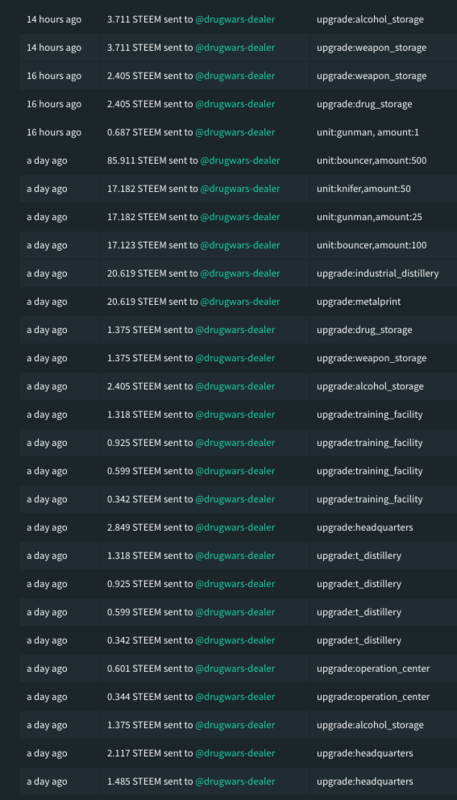 I've been hammered overnight, but at least you still earn from production. Regarding the WPS, I do not consider failures a waste of Steem (money) as we should remember than 1 in 10 business ventures fail anyway. This is part if the adaptation process but without funding, many ideas cannot even come to light. That's true! I'll join you. This is part if the adaptation process but without funding, many ideas cannot even come to light. I have been asking for these Ideas, I have not received one. I don't consider it an unreasonable question to ask for some example proposals that can't be build today without an SPS. Hell yeah! The more use cases the better. I keep saying we need some sort of integrated games here on the platform much like what they implemented on Neopets where people could play games for Neopoints. Good day @exyle! Your vlog really helps me clarify my thinking on this worker proposal thing. I kept reading and it didn't make sense, i kept coming back to the question 'but why? 'i am glad i am not the only one! I thought i just was not understanding something, missing something. I didn't know the deal was done between Steemit and Blocktrades. You are right, it will be a good idea to keep an eye on this. I couldn't bring myself to vote for either proposal. I am glad you're having great fun with the new game! As always glad to connect via your blog. Have a fantastic day too! Edit: i went over to a reply that @blocktrades made to me as i had some questions about their proposal and asked them 'why?' So hopefully we can have a little more light on the subject! Two more things, have you heard of @homesteaderscoop? It's an awesome peer to peer community where ppl are sharing the fruits of their labour. I recently made a purchase and product review there's links and more info about the store in my blog post if you want to explore further. From little things, big things grow!! Lastly, i wonder why I had to submit this edit twice? When i updated the post the first time, it was like the addition did not save. It happened once yesterday in a comment update too. But, has never happened before. I thought it was odd so that us why I am asking. Hopefully this saves! Thanks!! I am still on the fence about Drug Wars. I think time will tell how I am going to feel about it. I like the idea of the passive income aspect. I spent about 20 Steem the other day ramping up my drug production. If I can recoup that Steem through rewards in five days I will be pretty happy, then anything beyond that is profit. I have a feeling as more people jump on my rewards will dwindle to nothing though. I would just consider it a game. It's fun. I highly doubt it will be very profitable for anyone in the long run. This should give you an idea, it's part of a longer shopping list. Just don't forget that the users are bigger 'investors' then the 'money men' who don't invest time in the platform. And those 'investors' don't really have the users in mind do they? They merely want to see profit. So from that perspective Steemit is not a good investment as the investment itself undermines the end users gain. Specially the gain of the new users. A bit ironic. I think it is time that steemit would look a bit more at the users as investors, and listen to them, what they need. Really, I agree with your words. I'm playing Drugwars and it's a pretty cool game. Tomorrow I'll post about it on dtube. Maybe it's hard to say but we as posters can also say ok mr witness you vote for this and we lose 20% of our pool you lose our vote? Despite all the good stuff you do on steem? I agree major whales can say ok this is going through it's not a good votesystem. I will check that new game. It's very short through the corner but it is reality. I just signed in to @drugwars :) I love it... Thanks for the headsup ! !